Now that our Hyper-V host CARBON.Unit34.co has been setup up, we are now going to look at deploying our first domain controller. 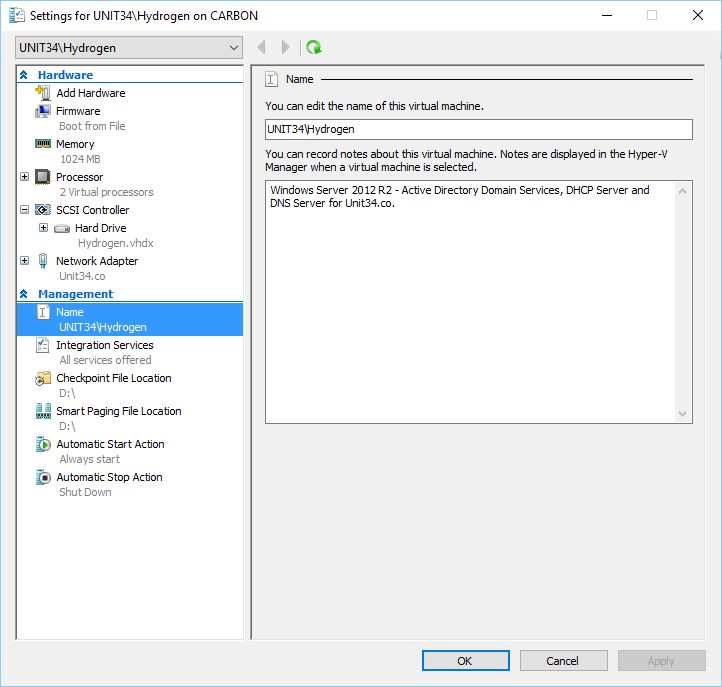 Our domain controller will be called Hydrogen and it will be deployed as a Hyper-V virtual machine on CARBON. 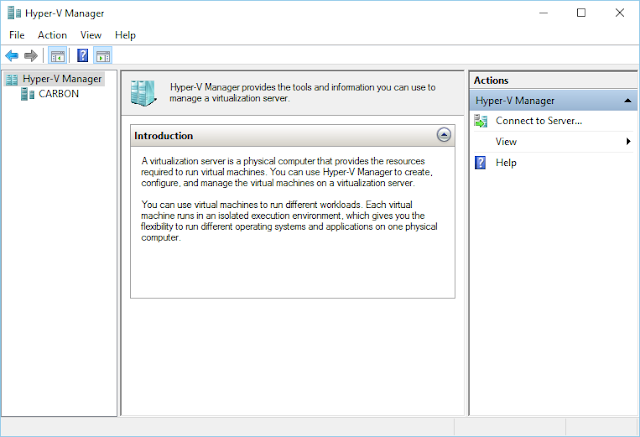 Start by logging into CARBON and starting the Hyper-V management console. 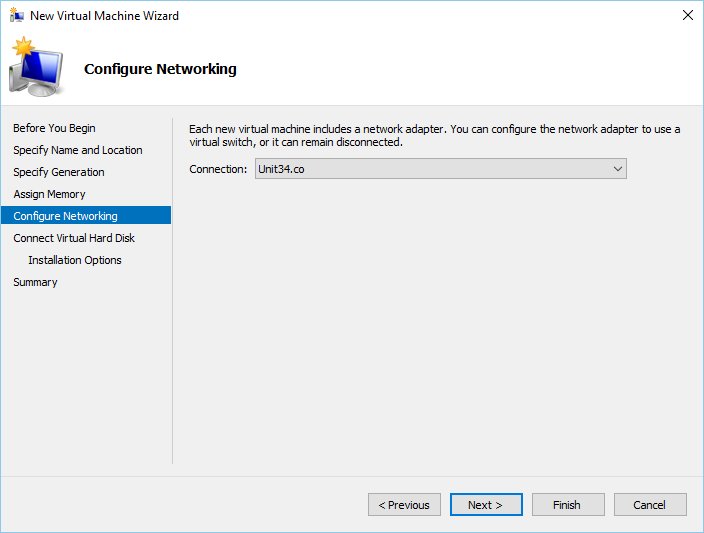 The first thing we are going to do is setup an external virtual switch so that our domain controller can communicate with devices on our physical network. 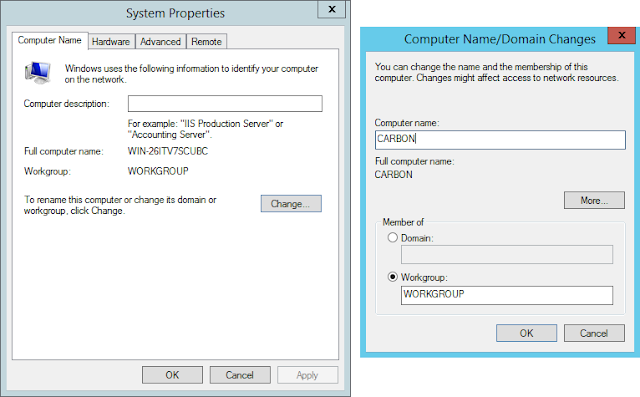 In the Hyper-V management console, make sure CARBON is selected in the left pane. Then in the right pane, select Virtual Switch Manager. Create a new external virtual switch called Unit34.co. 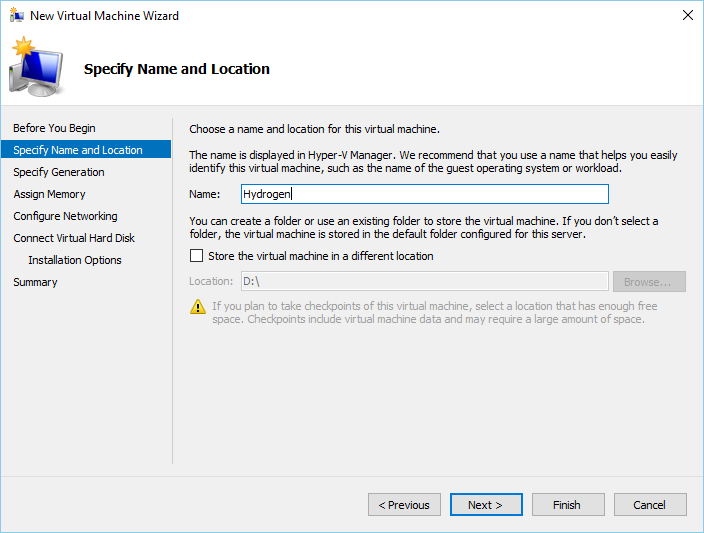 Specify Hydrogen as the name of the virtual machine. 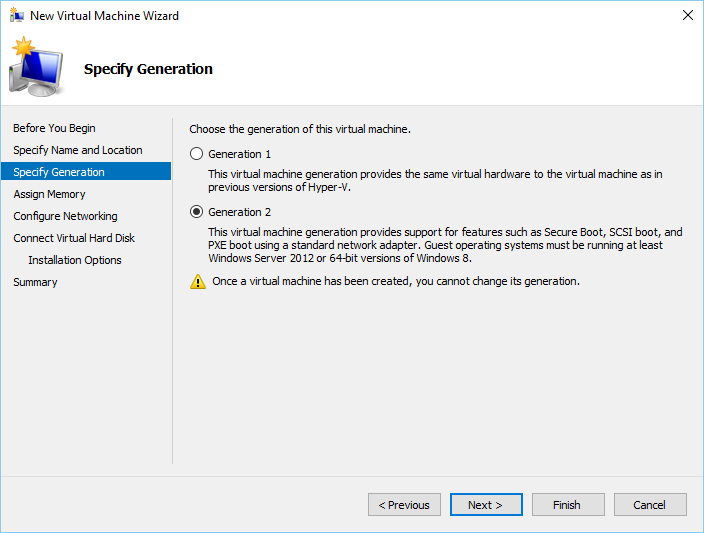 Specify Generation 2 as the virtual machine type. 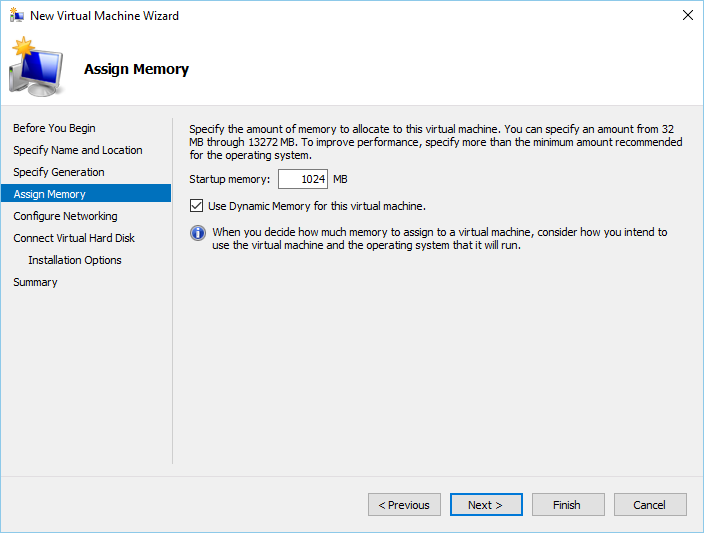 Give the virtual machine 1024 MB of startup memory and check Use Dynamic Memory for this virtual machine. Connect the virtual machine to the virtual switch we created earlier, Unit34.co. Create a new virtual hard disk with 40 GB of space. 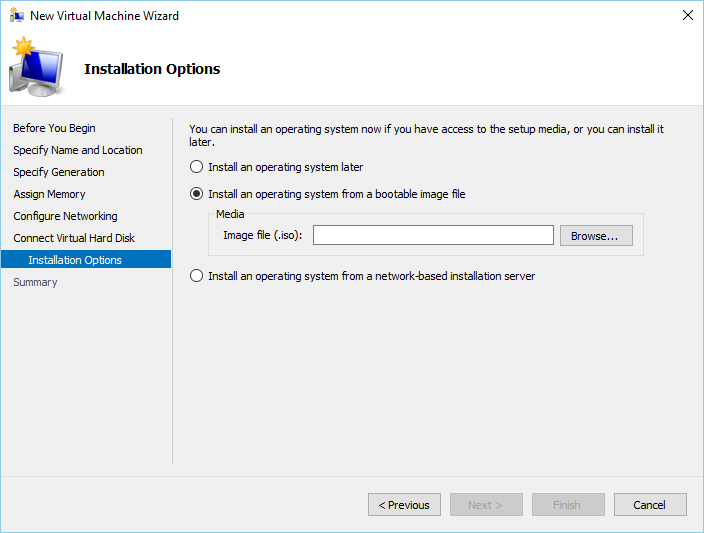 Selected your Windows Server 2012 R2 installation media. 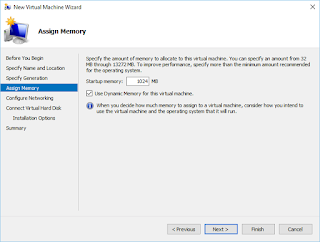 Once your virtual machine Hydrogen has been created, it should show up in the Hyper-V management console in the top-middle pane. Right-click on it and click Settings. Match the settings with the ones in the following screen shot. Note that in the screenshot, we've removed the DVD drive. Don't do this until you have installed Windows Server 2012 R2. 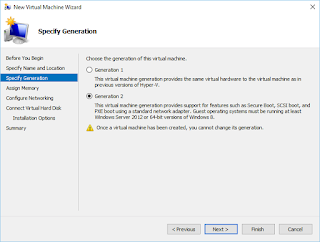 Boot the virtual machine and perform a clean install of Windows Server 2012 R2 Standard (Server with GUI). 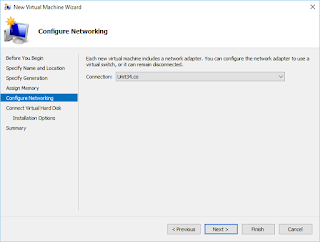 Since our virtual machine is running on a Windows Server 2012 R2 Datacenter host, we can use Automatic Virtual Machine Activation (AVMA). When prompted for a product key during Windows Setup, enter in the following AVMA key for Windows Server 2012 R2 Standard. You can find other AVMA keys in the following TechNet article. Once Windows Server 2012 R2 is installed, choose a password for the local Administrator account. We will use this account until domain accounts have been setup. As always run Windows Update after a clean install to make sure your system is fully patched. In our next articles, we are going to look at installing Active Directory Domain Services, DHCP and DNS. As I've mentioned in an earlier post, I've selected the WD Sentinel DS6100 as my server for Unit34.co. In this post I'm going to walk through how I've set this up and then leave it up to you to adapt it to your server. I've named my first server Carbon. 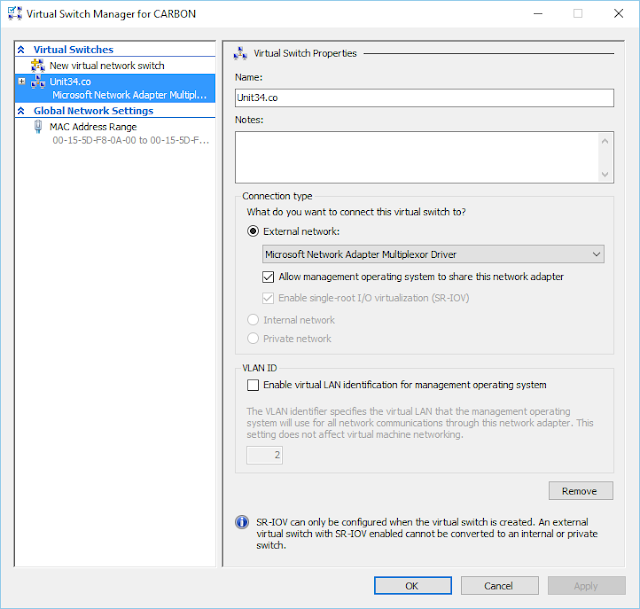 Carbon will have a clean install of Windows Server 2012 R2 with the File and Storage Services and Hyper-V role installed. All other servers that we will deploy for Unit34.co will be deployed as Hyper-V virtual machines on Carbon. 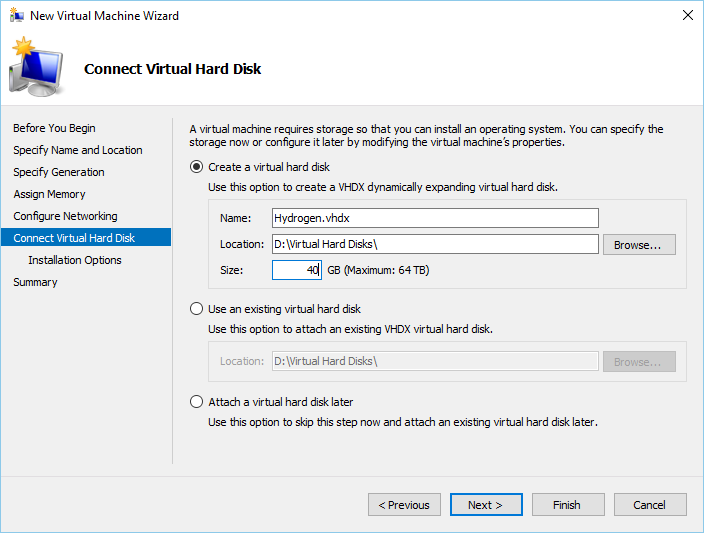 One of these Hyper-V virtual machines will be called Hydrogen. Hydrogen will be our first Windows domain controller. 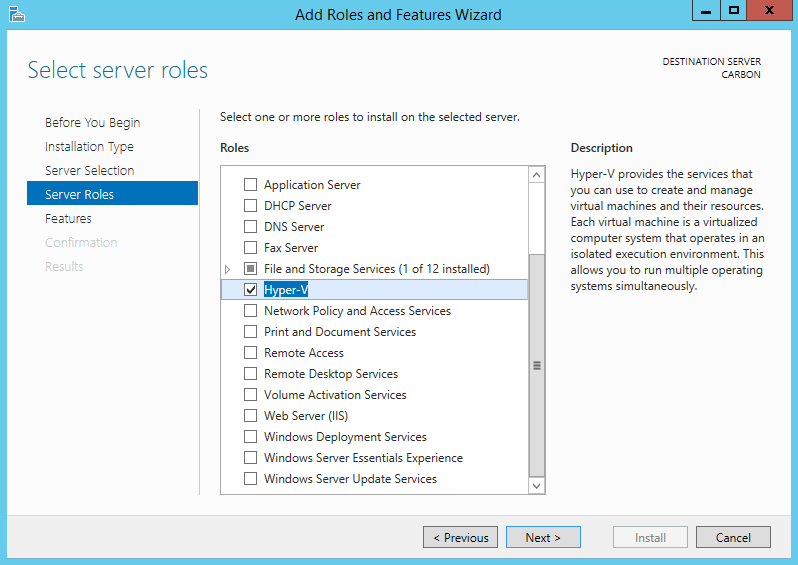 Start by performing a clean install of Windows Server 2012 R2 on your server. I've decided to go with the Datacenter edition of Windows Server 2012 R2 so that I can have unlimited activated instances of Windows 2012 R2 virtual machines. If you're using the WD Sentinel DS6100 as your server just like I am, I've written a guide for you here on how to perform a clean install of Windows Server on that server. Before installing Windows, partitioned the boot drive of your server with the following schema. You can do this with diskpart. 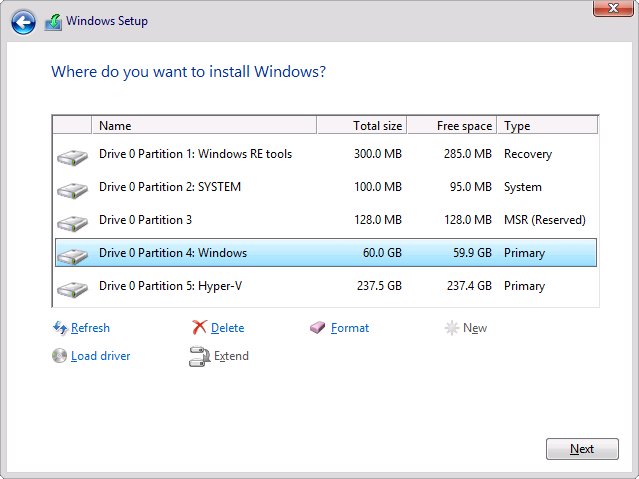 Install Windows on partition 4. Once Windows Server 2012 R2 is installed, choose a password for the local Administrator account. We will use this account until domain accounts have been setup. As always, run Windows Update after a clean install to make sure your system is fully patched. After performing a clean install of Windows Server 2012 R2, the LCD screen will not work and the system fan will spin at full speed. To fix this, you need to install the Windows Server Essentials Experience role and the WD components. Do not do this until you have domain joined your server to your domain! If you install the Windows Server Essentials Experience role before a domain join, it will automatically convert your server to a domain controller and create a new domain. This is not what we want. Log onto CARBON with the local administrator account, Server Manager should automatically start once logged in. Select Local Server on the left-hand side in Server Manager. Bring up the System Properties window by clicking on the computer name in the main pane. To rename your server click Change and then enter in CARBON for the computer name. Click OK to confirm the name change. You'll need to restart your server before it will take effect. Open the NIC Teaming window by clicking on NIC Teaming in the main pane. The NIC Teaming window has three panes. In the TEAMS pane, select the TASKS drop down menu and then select New Team. 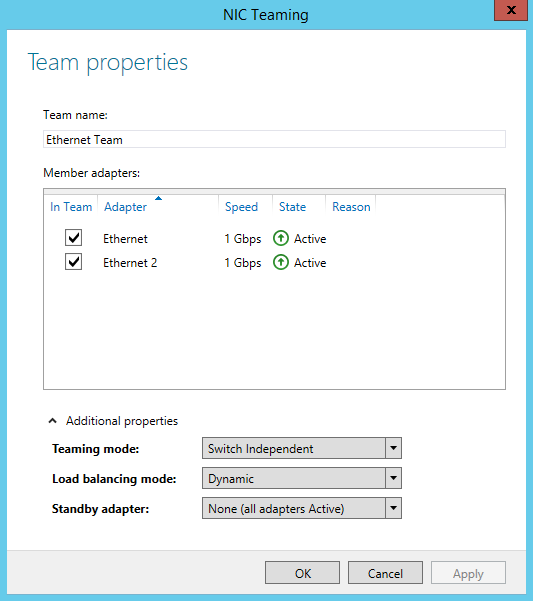 Enter Ethernet Team as the team name and select Ethernet and Ethernet 2 as member adapters. Under Additional properties, make sure the following is configured. Press OK to create the NIC team. Under the Manage menu on the top right, select Add Roles and Features. Go through the wizard by clicking Next until you get to the page, Server Roles. Leaving everything in the other pages on its defaults is fine for now. When prompted to include the management tools for Hyper-V, click on Add Features to add the management tools. Continue through the wizard until Hyper-V is installed. 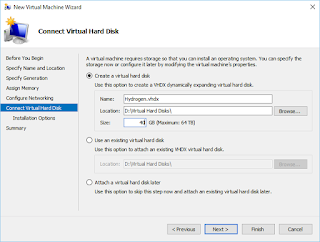 Earlier when we performed a clean install of Windows Server 2012 R2, you may have notice that we created partition call Hyper-V. This is where we are going to store our virtual machines. 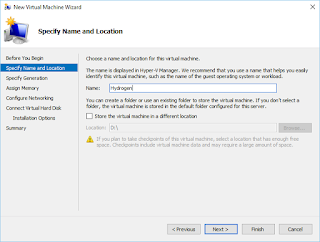 Once Hyper-V is installed change the following default directories in the Hyper-V settings.